One of the defining features of the ‘American Dream’ is the ideal that children have a higher standard of living than their parents (Samuel 2012). In a new paper, we assess whether the US is living up to this ideal by estimating rates of ‘absolute income mobility’ – the fraction of children who earn more than their parents – since 1940 (Chetty et al. 2017). We measure absolute mobility by comparing children’s household incomes at age 30 (adjusted for inflation using the Consumer Price Index) with their parents’ household incomes at the same age. 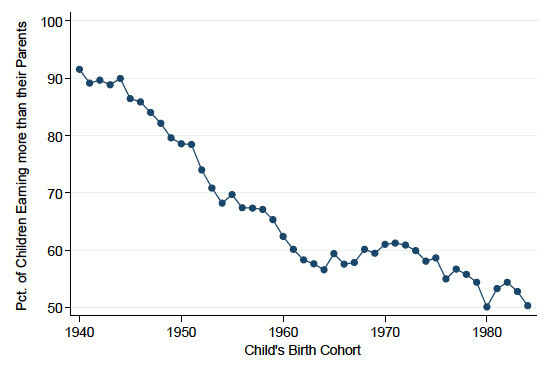 We find that rates of absolute mobility have fallen from approximately 90% for children born in 1940 to 50% for children born in the 1980s (Figure 1). Absolute income mobility has fallen across the entire income distribution, with the largest declines for families in the middle class. These findings are unaffected by using alternative price indices to adjust for inflation, accounting for taxes and transfers, measuring income at later ages, and adjusting for changes in household size. They are in line with similar previous studies documenting declining absolute mobility in occupational status (Hauser et al. 2000) and educational attainment (Hout and Janus 2011). 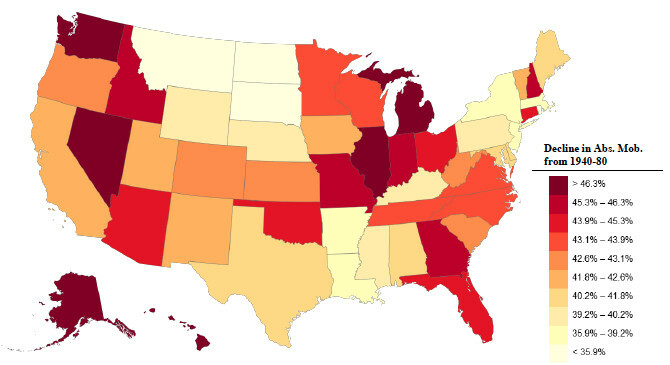 Absolute mobility fell in all 50 states, although the rate of decline varied, with the largest declines concentrated in states in the industrial Midwest, such as Michigan and Illinois (Figure 2). The decline in absolute mobility is especially steep – from 95% for children born in 1940 to 41% for children born in 1984 – when we compare the sons’ earnings to their fathers’ earnings. Why have rates of upward income mobility fallen so sharply over the past half century? There have been two important trends that have affected the incomes of children born in the 1980s relative to those born in the 1940s and 1950s: lower GDP growth rates (Goldin and Katz 2008) and greater inequality in the distribution of growth (Piketty and Saez 2003, Piketty et al. 2016). We find that most of the decline in absolute mobility is driven by the more unequal distribution of economic growth rather than the slowdown in aggregate growth rates. 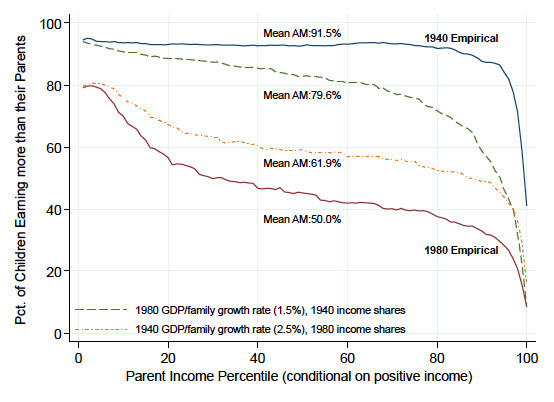 When we simulate an economy that restores GDP growth to the levels experienced in the 1940s and 1950s but distributes that growth across income groups as it is distributed today, absolute mobility only increases to 62%. In contrast, maintaining GDP at its current level but distributing it more broadly across income groups – at it was distributed for children born in the 1940s – would increase absolute mobility to 80%, thereby reversing more than two-thirds of the decline in absolute mobility (Figure 3). These findings show that higher growth rates alone are insufficient to restore absolute mobility to the levels experienced in the mid-century US. Under the current distribution of GDP, we would need real GDP growth rates above 6% per year to return to rates of absolute mobility in the 1940s. Intuitively, because a large fraction of GDP goes to a small fraction of high-income households today, higher GDP growth does not substantially increase the number of children who earn more than their parents. Of course, this does not mean that GDP growth does not matter: changing the distribution of growth naturally has smaller effects on absolute mobility when there is very little growth to be distributed. The key point is that increasing absolute mobility substantially would require more broad-based economic growth. We conclude that absolute mobility has declined sharply in the US over the past half century primarily because of the growth in inequality. If one wants to revive the American Dream of high rates of absolute mobility, one must have an interest in growth that is shared more broadly across the income distribution. Chetty, R, D Grusky, M Hell, N Hendren, R Manduca, and J Narang (2017), “The Fading American Dream: Trends in Absolute Income Mobility Since 1940”, Science 356(6336): 398-406. Goldin, C and L F Katz (2008), The Race Between Education and Technology. Cambridge, MA: Belknap Press of Harvard University Press. Hout, M and R Janus (2011), “Educational mobility in the United States since the 1930s”, in G J Duncan and R J Murnane (eds), Whither Opportunity: Rising Inequality, Schools, and Children's Life Chances, New York: Russell Sage Foundation. Piketty, T and E Saez (2003), “Income Inequality in the United States, 1913-1998”, Quarterly Journal of Economics 118(1): 1-41. Piketty, T, E Saez, and G Zucman (2016), “Distributional National Accounts: Methods and Estimates for the United States”, NBER Working Paper No. 22945. Samuel, L R (2012), The American Dream: A Cultural History, Syracuse University Press.